Premier shopping - check! World famous football clubs - check! 5-star hotels - check! Michelin star restaurants - check again! A major university, historical sites, a Saxon cathedral, cool bars, a hip and vibrant music scene - check! The Crown Jewels - ah, no. 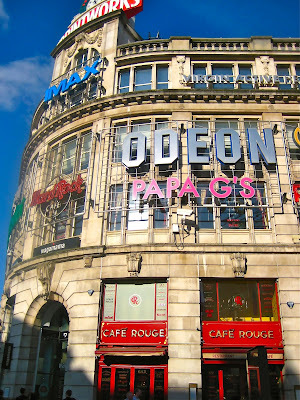 But Manchester, England has everything else. 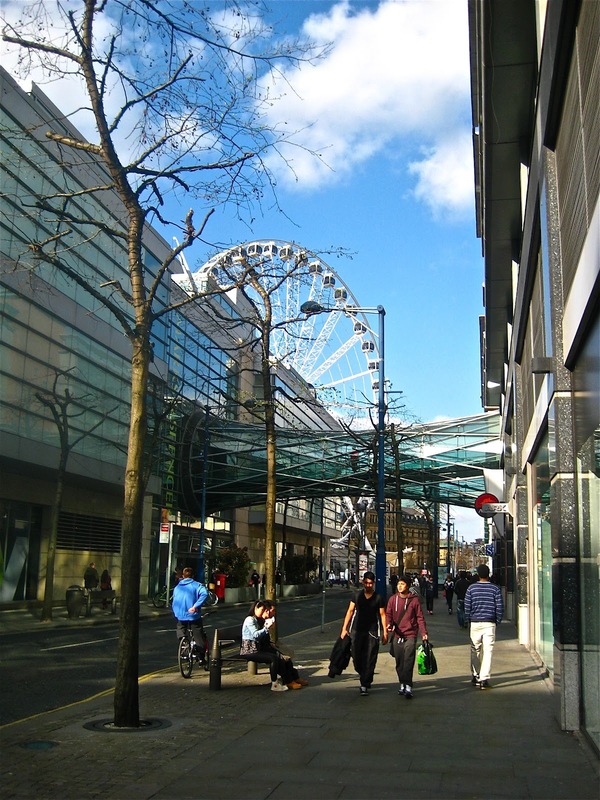 This is a city that is London, on a smaller scale. 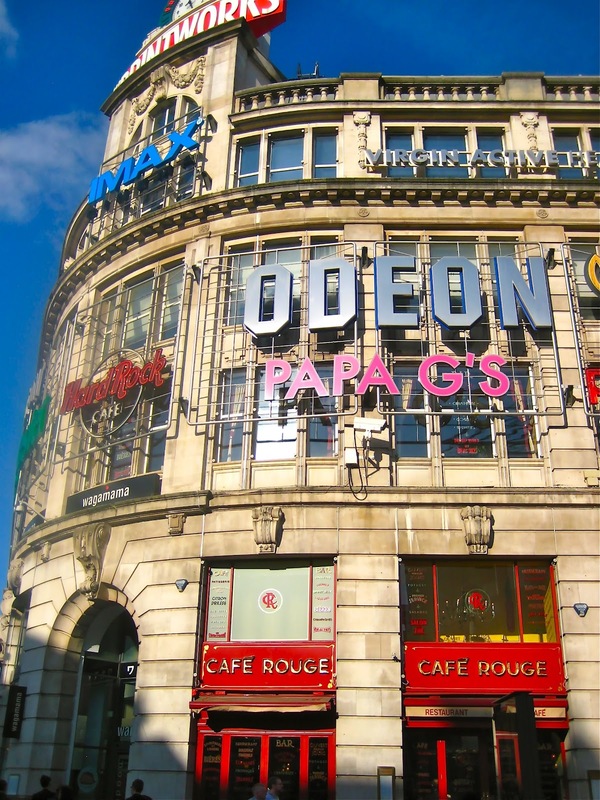 Manchester is the city that has it all. 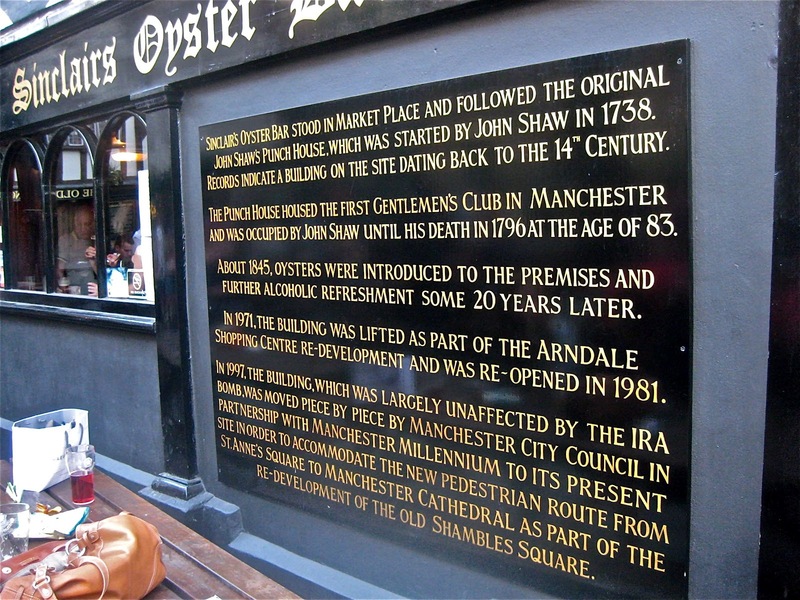 The Castlefield area lies over the old Roman ruins of what became the city of Manchester. Manchester Cathedral, built in Saxon 700 AD before Norman William the Conqueror swept through England, anchors the city, flying the English flag high. Even though it suffered heavy damage during the air raid blitzes of WWII, Manchester Cathedral has prevailed. 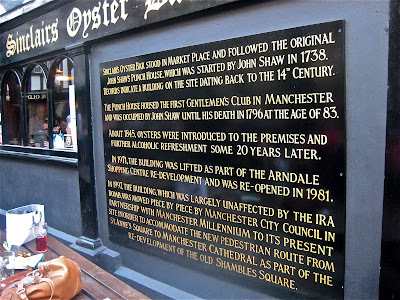 The IRA unwittingly helped Manchester when it bombed the city center, carving out a chunk. Manchester seized the moment for the better and became the phoenix lifting above its former industrial self, rising to become the vibrant and cosmopolitan city it is, with over 20 art galleries and various museums, high-end shopping with the likes of Harvey Nichols (which had at one of the make-up counters one of the most stunningly beautiful girls I have ever seen), Hermès, Links of London, and Vivienne Westwood, luxury hotels to cater to these shoppers (The Lowry, Malmaison), restaurants of every persuasion, and hot bars and cool clubs, often frequented by the footballers of Manchester City and Manchester United. 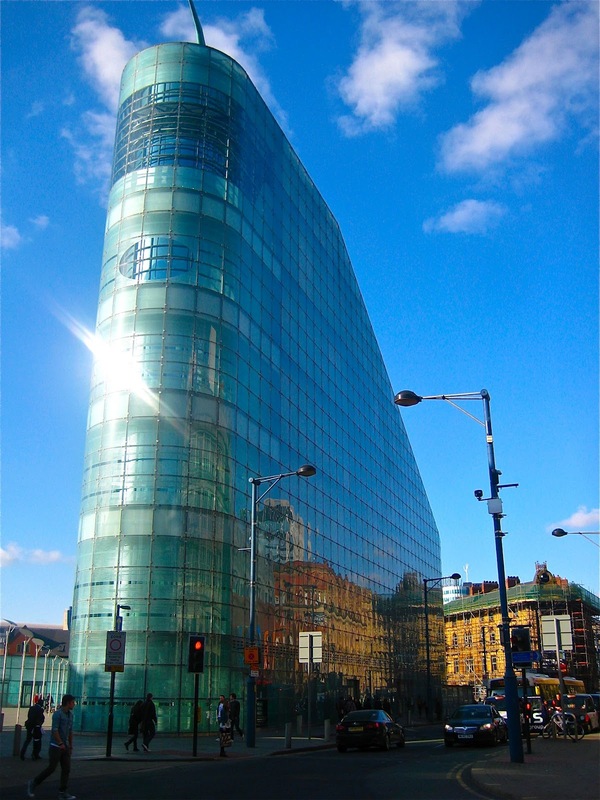 Even the National Football Museum is relocating to Manchester, to be housed in the Urbis Center. 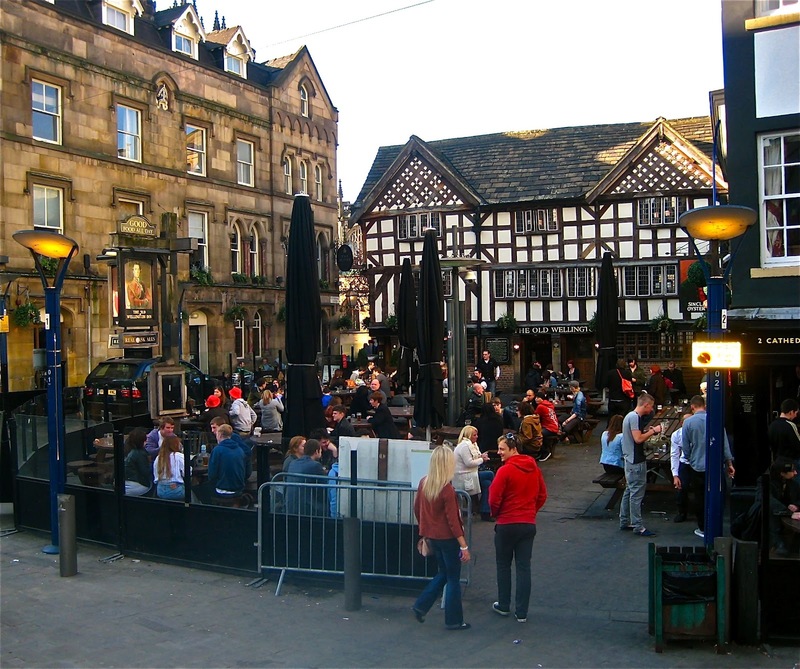 And, an unparalleled music scene with two symphony orchestras, world-renowned artists playing concerts at the Cathedral, and hometown bands the Charlatans and Oasis. Any night of the week, pick your pleasure from the cultural scene. 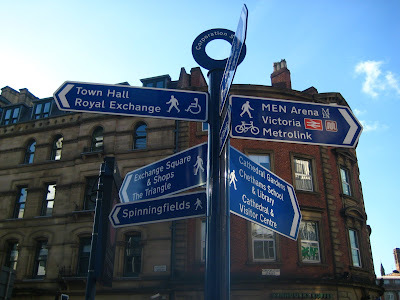 Manchester is decidedly diverse in population with a Chinatown that has its own gate to its “city” and restaurants housed in old cotton warehouses that can equal most any in Hong Kong; the Manchester Jewish Museum as the gatekeeper of the still present Jewish community’s history since the Industrial Revolution; a vast gay populace that congregates in the now revitalized Canal area, the perfect place to be on sunny summer afternoons with its many outdoor cafés; and Curry Mile, a mile long area of south Manchester made up of Pakistani, Indian, Middle Eastern and Arab restaurants. When I asked the hotel concierge which one he would recommend out of the mile long amount of choices, he looked at me as if I had 10 heads. “Any! Walk along and pick one with your nose,” was his answer. 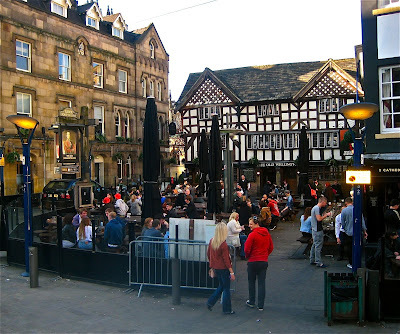 My flight attendant crew member Kris and I went to the outdoor pub at Sinclair’s Oyster House in Shambles Square in the city center, near the dominant ferris wheel. With a couple of pints in hand, we sat outside at the tables. An edgy young local with some missing teeth came up to us, holding his full beer, and with his even rougher looking buddy said, “dlibuiaosdu goiaudof elkgjos?” Kris and I looked at each other, and looked back at him. The buddy started laughing. I said, “You have to speak a lot more slowly for us to understand your... accent.” “Do-you-have-spare-change-I-could-have-for-my-next-pint?” I thought about that a second, looked at his full beer, and said, “If I give you my change, how am I going to pay for my next pint?” This time they both laughed, and then talked to us for a solid 10 minutes. Slowly. 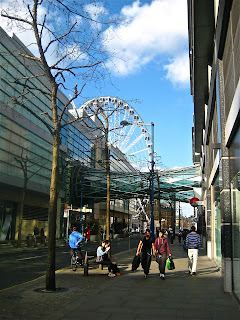 Manchester is a city that has star quality, smoothing out is rough, industrial city feathers. That is what makes it such a fantastic city. Being in Manchester heralds back to a time when a place on the global map wasn’t tainted or altered by commercialism and tourism. Manchester is a relatively small city in size, but powerful - it’s all there. It’s dynamic, and you see it and feel it. These are people who have a fierce pride being a Mancunian, and rightfully so. 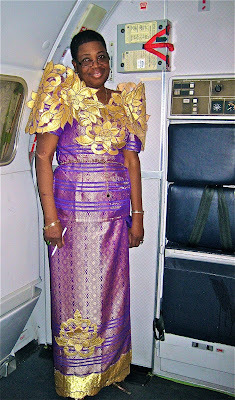 Until last Wednesday, I had flown into Port-au-Prince, Haiti only one time in the last 23 years as an international flight attendant. I remember the airport - and walking outside in stifling and suffocating heat and humidity along the tarmac perpendicular to the airplanes lined up and parallel to the building; I remember the vendor - her store was inside the airport, upstairs, and full of Haitian crafts, vanilla and liqueurs. 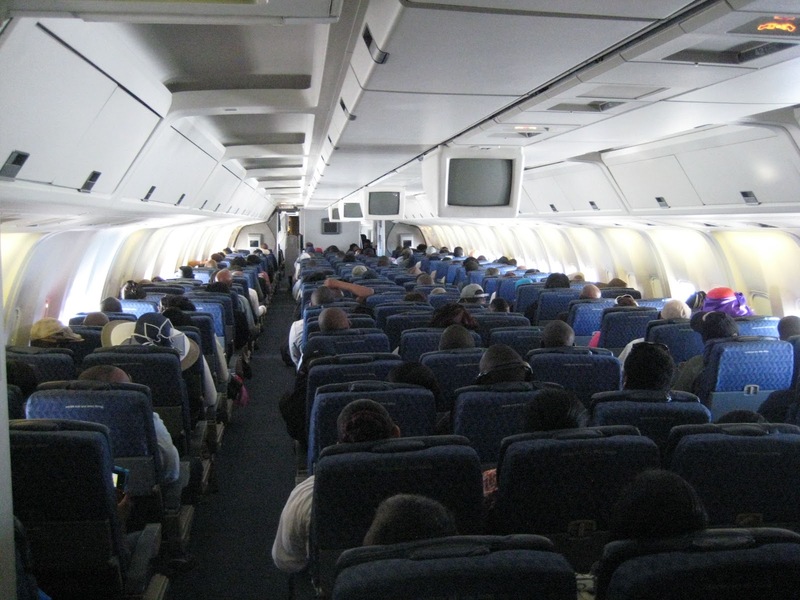 I remember how naively sweet the Haitian people were on the flight - many didn’t know how to flush the toilet or where to throw their wet hand towel, but many came dressed up for the flight in suits and hats, and always smiled at us working the flight. The airport looks different now; my original vendor where I purchased a stunning black iron serving plate decorated with bright fruit designs in 1996 was gone, and the outside path to walk to the airplanes for boarding is now covered. 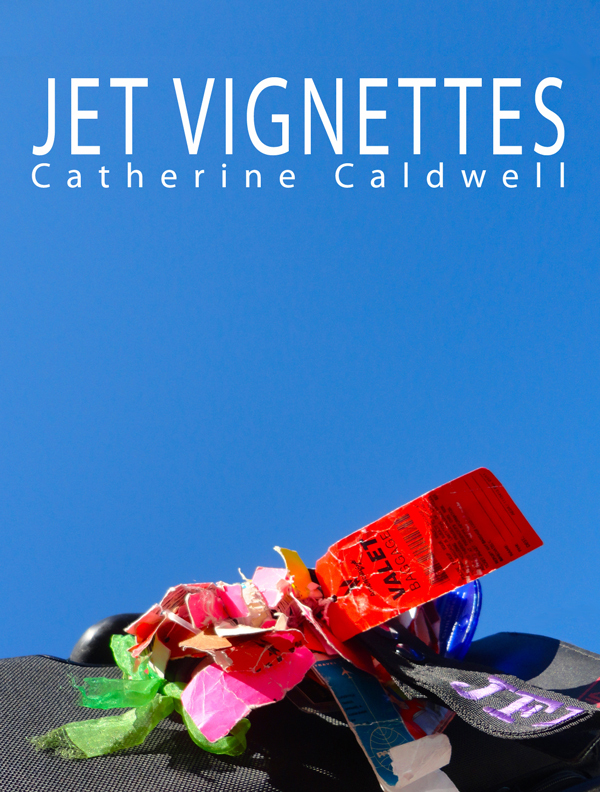 Looking out at the tarmac, I envisioned the wingtip to wingtip lineup of military and commercial aircraft parked two years ago bringing in desperately needed supplies of all kinds. 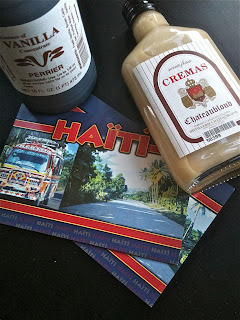 I went inside to buy the famous Haitian vanilla again. It was a different brand than before, but I was thrilled to see that even after the earthquake, some things are still available. The few vendors in the airport were eating plate lunches and the first vendor we stopped at had only a fish skeleton left atop her rice, with the head still attached. I purchased a bottle of Haitian Cremas, a rum based drink made with creamed coconut and either condensed or evaporated milk. It is served at holidays and on other special occasions, but I might just get it good and cold and drink some sooner as opposed to later since it is said to be like drinking a milkshake. Our passengers on our flight were the same, for the most part. Hats (one woman was wearing two new beautiful hats that still had the price tags on them), suits (both men and women), and still confusion over the lavatories’ buttons and design. A woman wore a silk gold and purple dress that was out of the realm of passenger attire on a Caribbean flight. She looked proud, and fierce, and beautiful. There is always one exception to the rule, and it was a 16 year old girl, who was not Haitian, and was part of a group of high school students who were on their way to New York City to perform in a musical concert. She was texting on her iPhone after the aircraft door was closed. When Alison, the flight attendant working on that side of the plane asked her to turn off her cell phone, the young girl - without looking up - dismissed Alison with a wave of her hand and said to her, “I’m busy.” Lucky for her, Alison is a patient flight attendant. Alison said to the young upstart, “Turn your phone off now, please, or you can sit in the terminal while we leave, and be busy there.” She turned off her phone. The next day our crew flew to Paris, France. We had French speaking flight attendants on both flights, however, the speakers did not speak French on the Port-au-Prince trip. No need to since the passengers speak Creole. But, to go from the former French colony of Haiti, to the “motherland” of France within 24 hours, glaringly pointed out the striking differences in two countries that at one time, spoke the same language. 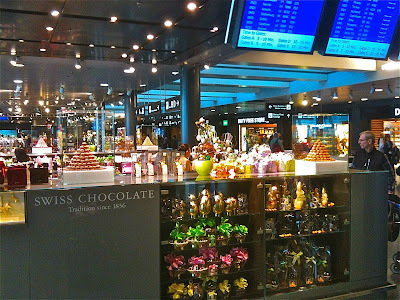 In the run-up to Easter, it is a downright bonus to fly to a country known for its chocolates. 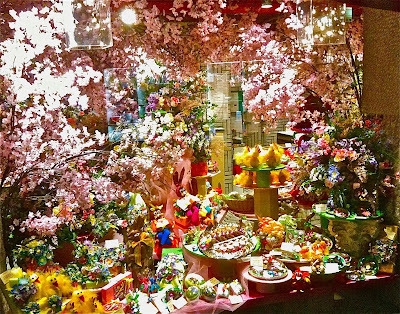 With so many choices on where to savor famed Swiss chocolates, on my layover in Zürich I took a three hour walk along both sides of the Limmat River to soak it all in, and be treated to over-the-top, spring window displays from a citizenship celebrating the end of another long, and cold, Swiss winter. Everywhere I turned, there were bunnies, or chicks, or eggs, or flowers, or Swiss chocolates, many in shapes every size imaginable, in virtually every store, and, of course, in the Swiss chocolate houses of Sprüngli, Teuscher, and Steiner. The windows, saturated with riotous floral beauty, speckled with chocolate bunnies throughout, made it a feast for the eyes as lush abundance stuffed the window fronts; these are the window displays that become the inspiration for wedding and party planners who spend hundreds of thousands of dollars to create a floral fantasyland for a bride. 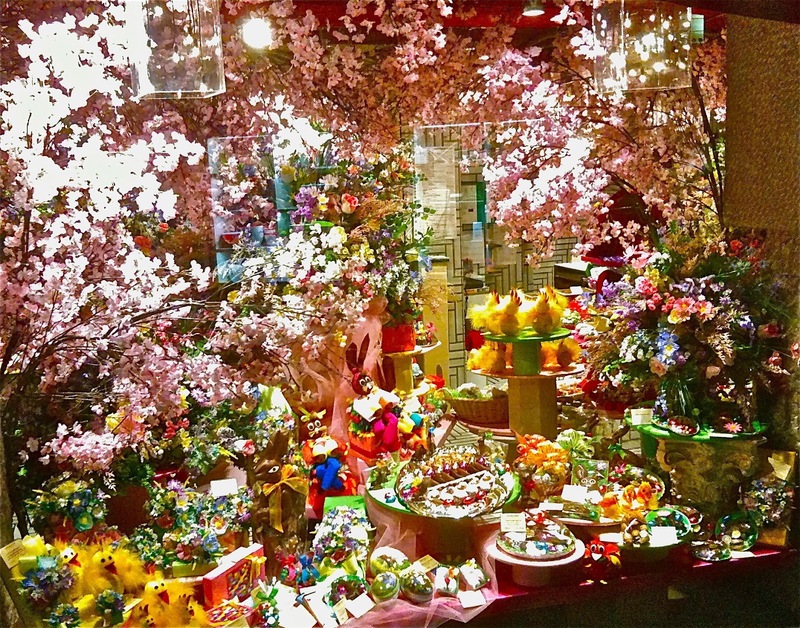 I was confident my favorite confiserie in Zürich, Péclard, would have window displays that defied all expectations. Péclard’s offerings of fresh, mouth-watering pastries, handmade chocolates, fresh flowers, and bunnies, bunnies, bunnies were a visual treat and sensory delight as I sat outside drinking a cup of café au lait, slowly savoring their fresh chocolate truffles. All through the Old Town, bookstores, home decor stores, gourmet food and wine stores, restaurants - all managed to display something to resonate loud and clear Easter and the advent of spring weather, almost three weeks into the spring season. 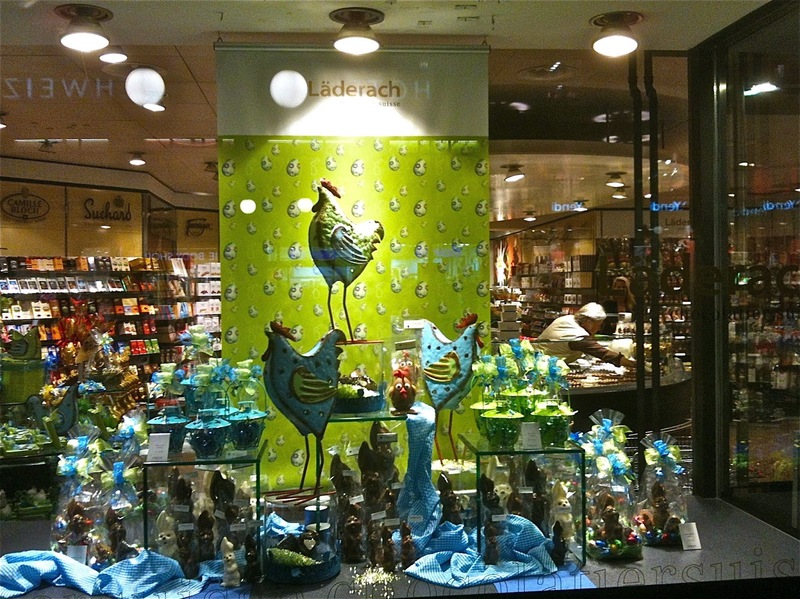 Even along the famed financial powerhouse Bahnhofstrasse, storefronts had every variation and persuasion of Easter bunnies: floral, paper, metal, glittered papier-mâché, and, of course, chocolate. The entry to one of the discreet Swiss banks along Bahnhofstrasse had tall, thin, metal bunnies sitting upright, guarding the entrance like sentry soldiers at Ali Baba’s cave. At the department store Wenberg, one block from Hermès and Prada, the mannequin showcasing women’s clothes stood surrounded by bunnies, in matching colors, no less. 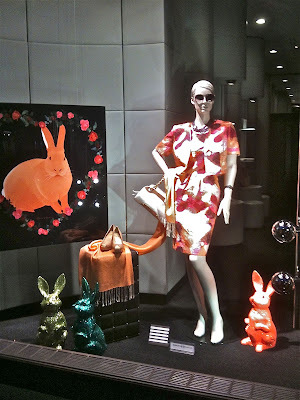 Along the Bahnhofstrasse, these are the stores where clients can buy not only the clothes shown, but all the bunny displays too, if they wanted. One of the jewelry stores had football sized gold eggs upright amongst the diamond necklaces. The next morning leaving Zürich, more chances to buy Easter bunny chocolates were throughout the airport. I stopped at Sprüngli. I couldn’t resist; I bought more.